I like vegetarian food. In fact, quite often we eat vegetarian meals without ever thinking, "This is a meatless meal." I'm willing to bet that you, too, eat vegetarian a lot without even giving it a second thought. Cheese pizza. Spaghetti with tomato-basil sauce. Mushroom lasagne. Cheese soufflé. Ratatouille. Quiche. 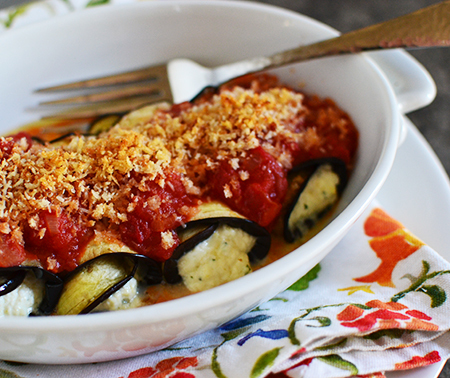 Stuffed eggplant. All sorts of Middle Eastern, African, and Asian dishes. It is impossible to make a comprehensive list. Of course, when we have vegetarians as dinner guests, the absence of meat is premeditated. For example, today's eggplant rolls. Our young friend RJ (a graduate student in Econ at the University of Arizona) was coming to dinner with his parents; I have known his mother since I was five years old. RJ is vegetarian and I wanted to make something special for him. This dish was it. It is the kind of vegetarian dish that doesn't make you wonder, "Where's the beef?" 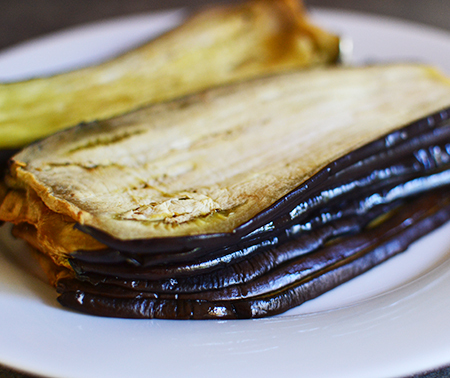 Notes to consider: I roasted the eggplant slices but you could easily grill them to impart a smoky flavor. 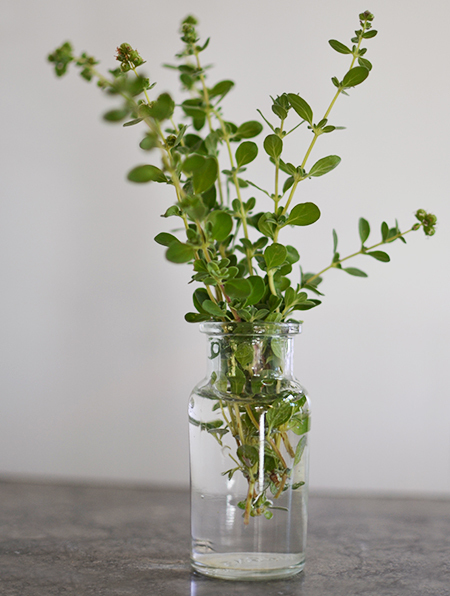 You can also use a variety of herbs for the filling, but I am quite partial to marjoram with lemon zest. When available, I use freshly made ricotta cheese and, for the tomatoes, if using canned, I always use San Marzano tomatoes. In a large heavy-bottomed saucepan, heat oil over medium-high heat. Add shallot and red pepper; sauté until the shallot is soft and translucent, about 5 to 10 minutes. Add tomatoes and break up with the back of a spoon. Season with salt and Pepper and simmer uncovered on low heat for 20-30 minutes until thickened. Taste for seasoning. Set aside. Trim the ends off the eggplant and, using a mandoline, cut them lengthwise into 1/4-inch thick slices; you will need 16 slices. (It helps to oil the mandoline lightly, as the eggplant catches easily.) 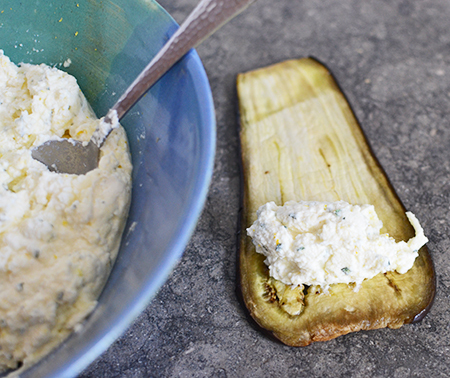 Arrange eggplant slices on cooling racks and sprinkle both sides with salt. Let sit for 10 minutes. Wipe off the salt and pat slices dry with paper towels. Line a baking pan with aluminum foil. Liberally oil the aluminum foil, then place a third of the eggplant slices on the foil-lined sheet and bake for 15 minutes, turning once halfway through using a spatula because, even with the oiled foil, the eggplant slices will stick and tear if you use tongs. The slices should be soft and pliable, and not browned. 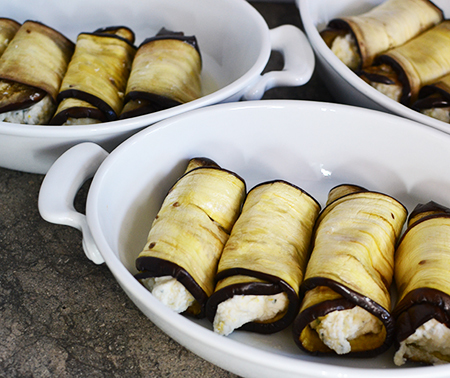 Place slices on cooling racks and repeat with remaining sliced eggplant in two more batches. Allow slices to cool. In a large bowl, mix the ricotta with the egg, mozzarella, marjoram, lemon zest, and 3 tablespoons of Parmigiano-Reggiano cheese. 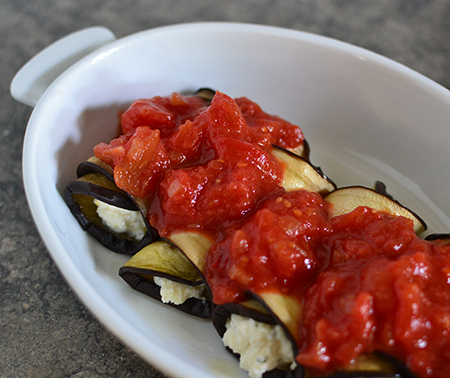 Place a heaping tablespoon of the cheese mixture on the wide end of each eggplant slice and roll up tightly. Place the eggplant roll into an oiled 9 by 13-inch baking dish (or individual baking dishes, as I have done here), seam side down. Continue with remaining eggplant slices. Spoon the tomato sauce over the eggplant rollatini (using four individual casseroles, I used 1/2 cup tomato sauce for each). Season with salt and pepper. Heat the butter in a small skillet, and add the breadcrumbs, cooking until they turn golden – about 5 minutes. Let cool. 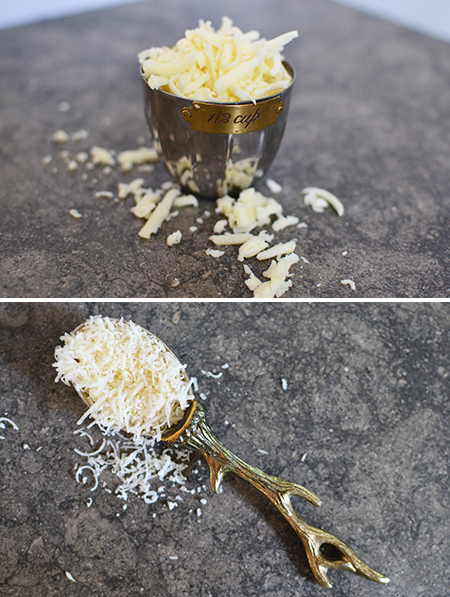 Mix the remaining 5 tablespoons Parmigiano-Reggiano cheese with the breadcrumbs and sprinkle over the sauced rollatini; bake for 15-20 minutes. Beautiful dish! Murphy's Law takes effect whenever my daughter has vegetarian friends drop in for dinner. We could have 3 vegetarian meals in a row, but surely, the night they'll pop it, it will be steak pie or pasta with bolognese! UGH! That's funny, Christina! For moments like that, I always keep a Tupperware container of tomato basil or tomato saffron sauce in the freezer - easy to thaw and get on the table in the same time the pasta is cooking! It is definitely the best when fresh eggplants are available. Luckily, we are still getting a few from the farms here, but probably not for long, as it is getting cold! Yes, Marcelle - most carnivores ,love this meal and forgot it is meatless! I adore eggplant so much yet seldom cook with it. I'd been wanting to do something like this before we left home but never got around to it, and now that I've seen it again, I desperately want some! What a pity we're in the wrong part of the world for eggplants! We got a bit tired of our usual eggplant recipes this year. This looks nice and fresh so I'll have to put it away for eggplant season. Interestingly, I was just saying the same thing about eating meatless without planning to! It's funny, Inger - last night I made a fish choder and, afterwards, said to mark that I would have been just as happy with leek and potato soup! Hope you get to try and enjoy this! Hi David, San Marzano tomatoes are the best, I always try and use them as well. Love this dish, I have never rolled eggplant like this in a dish, very impressive. Looks like we are in for some rain this evening, take care! Cheri - it's funny, but I thought (after reading your comment last evening), "How funny that Phoenix is getting rain and we aren't..." Then, about 30 minutes later it rained here for a nice, long, and steady! I should always use you as my weather source. 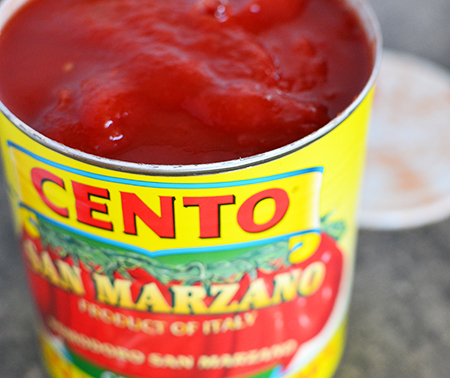 I never use anything but San Marzano tomatoes any more. The taste quality is so far superior! Thanks, Valentina - I love the Cento tomatoes, too. For the price and availability, they can't be beat! 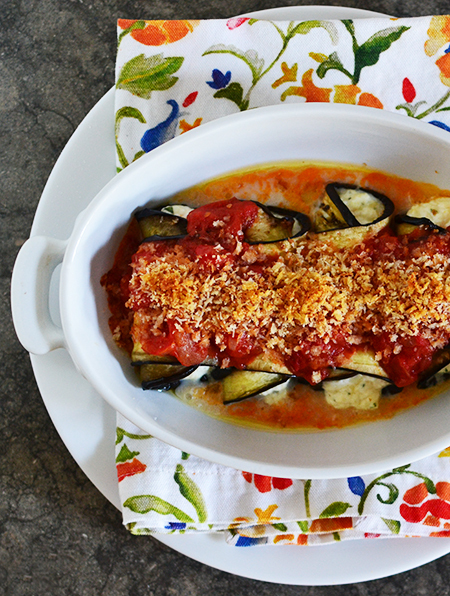 Eggplant has such a meatiness about it that you certainly don't mind having it prepared as the star of the dinner…no meat needed. Your rollatini looks delicious. Thanks, Karen - I feel the same way about mushrooms. I'm exactly the same, eat loads of veggie food and don't ever miss the meat. This sounds delicious! Caroline - my problem is that I often add lots of pasta with my veggies - and that has an undesired effect on my waistline! 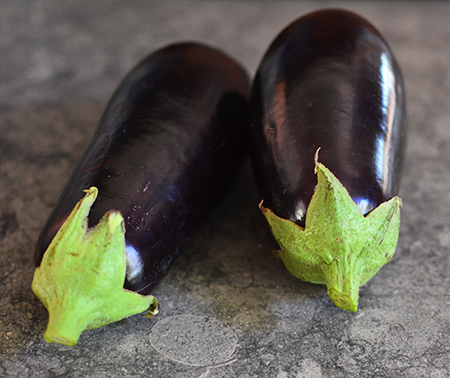 Who needs meat when you have eggplants, your dish looks and sounds delicious. I wish I could convince my hubby to like eggplants. Ohm how sad that he won't eat eggplant, Gerlinde - I ma very lucky in that regard as we both pretty much eat everything (now that I have convinced Mark that sweet potatoes and butternut squash aren't anathema...). Then you're a lot like us. And the way my grandmother ate, mostly plants especially during the week without actually being strictly vegetarian. That is a really great way to think about it, Frank! WIth all of the eggplant I harvested this past summer, never once did I think of rollatini. That just won't do! Next year, rollatini will be on the menu, to be sure, and since my family never prepared the dish, yours is the recipe I'll stea ... er ... follow. It sounds delicious, David. Thanks for sharing. Wow - with a harvest like yours, John, that is quite a surprise! You are welcome to beg, borrow, or steal it any time you want! That is what this is all about!